This website hosts the archives of Annales des Sciences Forestières from 1964 to 1998 (1287 papers). The journal switched from a French science journal (with many articles in French) to a fully international research journal with almost all papers in English. 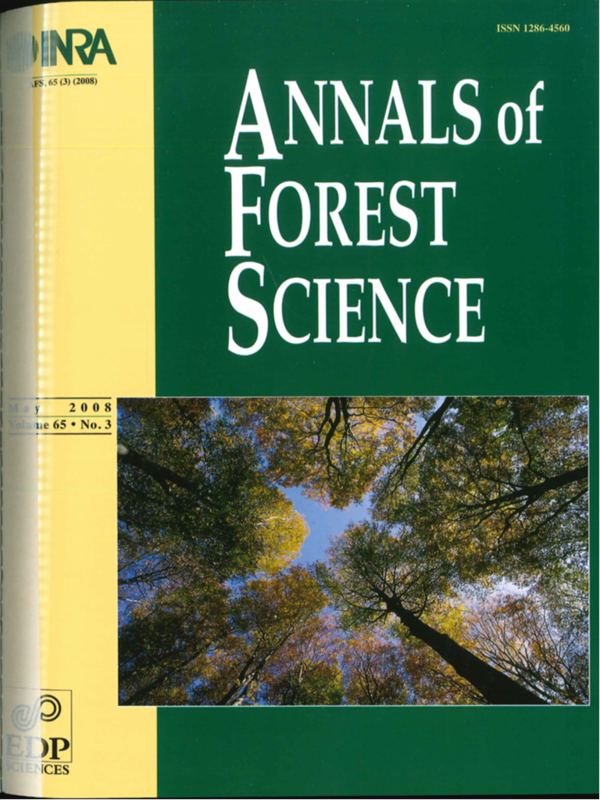 In 2000, the journal changed its title to "Annals of Forest Science". The former journal editors were Jean Pardé (1964-1984); and Gilbert Aussenac (1984-2006). The journal was published by Inra (Institut National de la Recherche Agronomique), then by Elsevier France from 1989. The current issue of the journal published by Springer is available on the publisher website. To access the articles published from 1999, please see the archive named "Annals of Forest Science" at https://hal.archives-ouvertes.fr/ARINRA-AFS. You may browse the archive by years, by volumes, or by using the search facilities of any web-browser. Titles, date, author names, volumes may all be used as entry to the content of this archive. 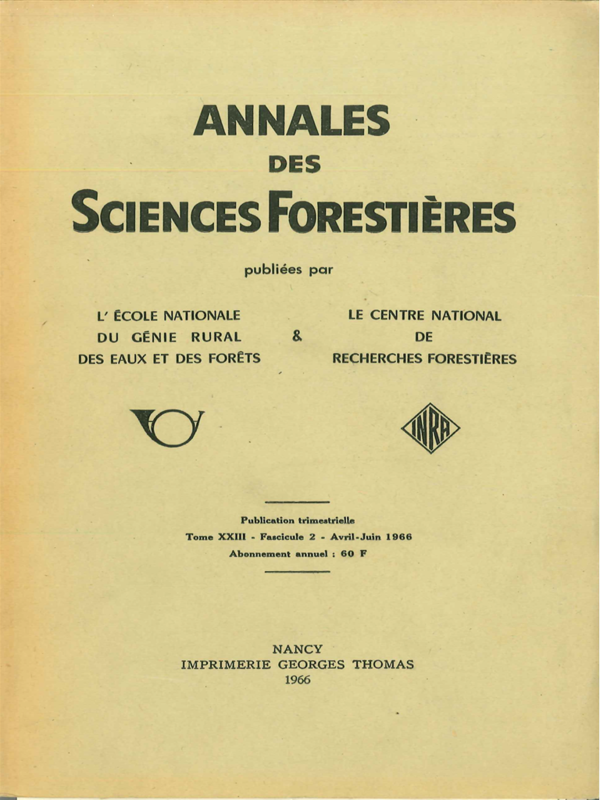 "The first forest science journal “Annales de l’École Nationale des Eaux et Forêts” was launched in 1923. At that time a specialised journal was required to publish the research work of the Forestry Research Station, which was part of the École Nationale des Eaux et Forêts. The first 16 volumes, consisting of 33 sections (with a 15.5 × 23.5 cm format) were, in theory, published annually, but in fact they were a little erratic, particularly during the second world war. From 1960, the “Annales de l’École Nationale des Eaux et Forêts” consisted of 4 sections, with about 600 pages per year. In 1964, following the creation of National Centre of Forest Research as a part of INRA (National Institute of Agronomic Research), the title changed to “Annales des Sciences Forestières”. The intention was to modify the Annals into a journal able to publish papers from the Forestry School and from Inra. However manuscripts submitted by scientists outside these organizations were also accepted. French was the official publication language, but occasional papers were published in German or English. The journal was considered as a means of exchanging ideas with publications from foreign research institutes, especially those members of the International Union of Forest Research organisations (IUFRO). In the 1980’s, there was a gradual evolution towards more papers from national or international scientist: manuscripts in English were accepted from non-French speakers; an Editorial Scientific Committee was created. In 1989, the journal became bilingual English-French; and aChief Editor was nominated. An editorial policy was developed, with the aims of publishing the results of research in the fields of ecology, silviculture, genetics, physiology, damage to forests (entomological or pathological causes) and wood quality, in the form of original articles, summary articles and notes. During 1990, the journal switched from 4 to 6 issues per year. During 1999, the title changed to reflect the increase in the number of papers published in English, written by a majority of international, but also French authors, and “Annales des Sciences Forestières” became “Annals of Forest Science”, with 8 issues per year and a larger format of 21.5 ×27 cm. The journal published from then on about 100 papers per year." The archives of Annals of Forest Science from 1999 to date are available here. The archives of Annales de l’Ecole Nationale des Eaux et Forêts are available here.